As a gardener you quickly realize how intricately connected the health of what you’re growing is linked to the health of your soil. Soil rich in organic matter, with balanced pH, minerals and a thriving microbial and fungal community will deliver vibrant plants. Typically, I prefer perennial flowers. If sited in your garden correctly (that is, the environment, sun exposure and moisture and general soil attributes), after a little babying the first year- perennials can grow with minimal input from us for years. And after a few years, you can even divide them to fill in other areas of your yard. Bonus plants! Plus, this way I can chose native plants that will serve my area and wildlife best. But I’m not talking about perennials today. Today I’m talking about annuals. I generally prefer annual plants that readily self-seed. See, I don’t like spending a lot of money at the garden store on something that will die towards October. Especially if I’m not eating it. (I spend plenty of money at the garden store on other things!) And while I start some plants indoors by seed, I don’t have a huge space or set up to accommodate starting flats and flats of annuals from seed, like my mom can. Also, I really want my annuals to work for it. Not just be pretty, or serve as nice cut flowers or feed pollinators and wildlife. I like annuals that just by physically being there is improving my garden. I clearly demand a lot. So I put together this list of no-fuss annual flowers you can plant that have an amazing quality about them- they can actually improve your soil while they are growing, looking beautiful and helping pollinators. Most of these self seed decently too in my 5b garden- or it’s easy to pick a few seeds and scatter them around while expecting a few to come again the next year. Let’s get to that list! Sunflowers are super at improving soil. Why? Their huge root system. Sunflower roots reach deep into the ground to access water and support their massive height and weight. All those roots mean that organic material (the roots themselves) are distributed far and wide throughout the soil. When the plants die come frost-time, all that root material stays in the ground and will decompose over winter. What I typically do is cut the plants down at ground level, never pulling the root ball out so as to preserve that material in the ground. Then, as an added bonus I’ll strip many of the leaves and leave them laying on the ground as mulch. It’s not the prettiest- but nothing is super pretty in November and it’s my backyard. In addition to serving as critical nesting and protection for ground dwelling animals and bees, the sunflower leaves are full of minerals that have bioaccumulated within the plant- those minerals have been brought up from taht deep and extensive root system. Finally, I”ll cut off most of the spent flower heads and chuck them on the ground too. We’ve had sunflowers for years now and I’ve never planted a one- the birds and animals disperse the seeds through their foraging- and I’ve thrown a few flower heads around and plants always emerge from those sites. Sweet Pea makes the list for it’s nitrogen fixing properties. Plants in the legume family all fix their own nitrogen out of the air due to the symbiotic relationship they have with Rhizobium, bacterial that set up shop in root nodules in legume family plants. There are lots of pretty legume family plants to chose from, but sweet peas are beautiful in a classic sense and can be at home in any garden. My neighbors would never care what I have growing in my front yard, but for some reason some folks neighbors do care (don’t they have other things to worry about?) and if that’s the case, beautiful sweet peas snaking up your trellis or fence is a bit more sightly than a mass of scarlet runner beans. At the end of the season be sure to leave the root systems in the ground- cut the plant at ground level. All that nitrogen can stay in the soil for the next year. And the plant makes an excellent addition to your compost pile. I’m including alyssum not for what it does to the soil per se, but how it can protect the soil. One component of healthy soil is retaining moisture. High percentage of organic matter (6-8%) helps with this, as does a top layer of mulch. But the concept of a living mulch should not be overlooked. A living mulch is basically a ground cover that shields the soil from sunlight, keeping moisture in and weeds out. Alyssum is low- generally never more than a few inches high. It’s easy to pull out or push aside, should you want to plant into your living mulch. I find that it self seeds, but is fairly patchy, so I will sprinkle more seeds around to help it out. It comes in so many colors too- it can easily compliment any garden. Borage is another prolific self-seeder. It can border on a weed but it’s easy to pull and if it pops up in the grass, mowing it down will stop it in it’s tracks, so it’s hardly a bother. Borage, like sunflowers have a deep root, and thus like sunflowers will leave a massive root system in the soil come the end of season and can bioaccumulate minerals from deep underground. Borage’s root is more like a taproot and thus can be thought of as a ‘biodrill’. Biodrilling is the concept of breaking up tough, particularly clay soils & compacted soil using a strong taproot. Daikon radish is very adept at this and is often used as a cover crop for this purpose. The taproots allow water to better penetrate the soil and make it easier for next year’s plants roots to go deep into the soil- literally following in the footsteps of last season’s taproot. 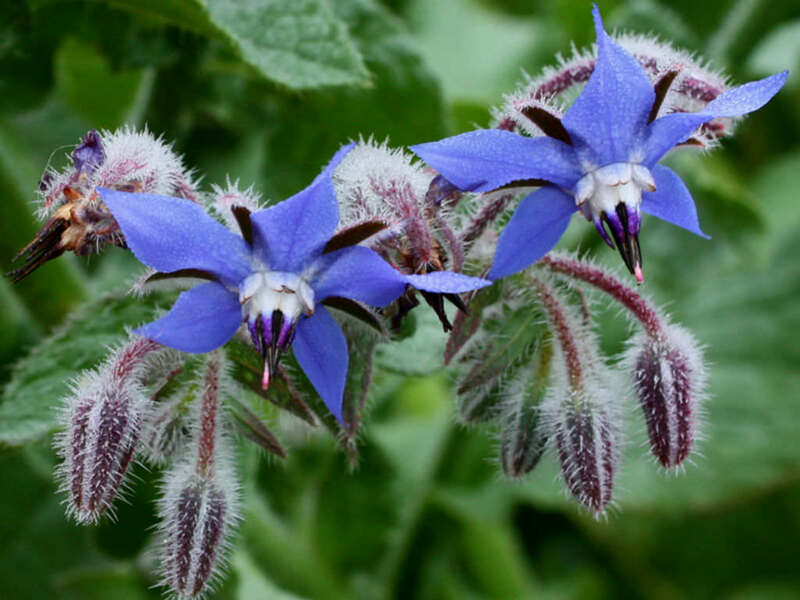 Borage has lots of other great characteristics as well that I’m not even going into here (edible leaves, flowers, companion crop) so if you’re interested, seriously check it out. Bachelor Buttons make this list mainly in their no-fuss nature. Bachelor buttons are often added to flowering cover crop seed mixes because they don’t require much water, can withstand lots of conditions and quickly leaf out. This quick to add leafy material quality is what makes bachelor buttons a nice ‘living mulch’. If you need to cover some soil for a few months, want it to look pretty, and then want to till that all under again, look to bachelors buttons. The small and thin leaves rapidly break down, making it an ideal flowering cover crop that can be quickly and easily tilled back into the soil. So that’s the list. What say you? Do you know of any other easy and beneficial annual that I can use to bulk up my soil? What about perennials, I think I’ll make that list next!